Two years ago, I spent some time meditating in an alcove at the Jesuit Center where Green Tara rested beneath a painting of the Madonna. Last year, she wasn’t there. This year, I am going to search for her again. 2. (What inspires you?) The friend who keeps running, keeps walking, keepings signing up for those half-marathons. Reading last year’s reflections on an educational seminar I took. 3. (What catches your eye?) Daylily, Chicory, and Queen Anne’s Lace are a-bloom again. Contrasting colors of orange and blue, and that lacy white among them. 4. (What keeps you in the moment?) The oriole calling from the honey locust trees by the parking lot. 5. (What draws you into the future?) Yesterday’s conversation with a teacher friend about the past year, about what sort of teachers we want to be. The gangly growth spurts of my children. The anticipation of next weekend’s solitude retreat. Another version of the moth. Erf. I got kind of grouchy this evening, trying to give an extremely thick-haired kiddo a haircut. He was twitching his head all around, the mosquitoes were whirring all about our heads, younger brother kept dancing past mashing blueberries all over his own face and trying to get attention, the cat kept pawing at us and crying to be picked up, and it was getting dark. I really want to let my kids get messy and filthy, but I wasn’t very pleasant with the mulberry-faced youngster. “Daryl–this is your cousin Bob.” Etc., etc., etc. 2. Knowing we’ll have bags of frozen mulberries for smoothies. 4. Serious talks with the kids. I was paging through some Facebook pages while Ellis was looking over my shoulder. He wanted me to stop and look at the article about raising feminist boys with him. It led to some great discussions. 5. In some ways, tonight is actually the real beginning of summer vacation. While I do still have to clean my room and grade my papers, I don’t have to wake up tomorrow morning and go anywhere right away. I am on my own schedule now. No Sunday afternoon panic. The weight is lifted. And, I have more energy right now than I remember having at this point in previous years. Even though this year’s grading was more stressful for me than ever, I still feel much more motivated to do the work I need to do. My friend Kyla was to have heart surgery today to implant a ventricular assist device, but she’s developed an infection, and will have to put off the surgery. Meanwhile, she waits for a new heart for a heart transplant. Today her friends are wearing purple to support her. 1. Laughing with friends gathered on a hillside. Children (and adults, too!) whizzing down a waterslide. Good food and conversation. 2. Singing together. Blended harmonies. 3. Community conversations. Bringing up the topics that we’re sometimes too uncomfortable to talk about. 4. Feathers. Every day a feather or two or three. 5. Waking up. And waking up. Finally, a candidate I can really support! 1. Co-thinking discussions. I love conversations in which the unstated premise is that you are taking the information or idea offered by the other/s and building upon it or re-interpreting it in your words, then leaving your piece out there for someone else to mold and shape and build upon. I always feel like I come away from such conversation with a deeper understanding of the world than I went in. 2. Just doing the tourist thing. We spent yesterday morning with friends being tourists in Lancaster County. Despite the “touristiness,” it was fun to watch people and to consider what about this place makes people want to come here. I love Lancaster County. 3. Those phoebe babies getting ready to fledge from the forebay rafters. Nobody can look madder than a baby bird. 4. Moving into the next stage of summer. There was the finishing up and recovery time, and then the relax a bit and play time. Now comes the get down to business time. It’s true that the second year of teaching in a new place is easier than the first. It is also true that the difference can be sort of minimal. But now, preparing for my third year, I feel much more energized for the preparations. I can see the planning all mapped out in my head much more clearly, as opposed to simply hopefully. 5. We are not alone. The world gets so heavy sometimes, but it’s at the heavy times that you can look around you and see all the people who are stepping out to the front to get the Work done. Sure, there’s a lot of fluffy and ranty clamor that distracts, but keep your eyes and ears open. They’re there, stepping into the fray, holding people, presenting clear and thoughtful ideas, loving their neighbors and the world. Often, they’re keeping their mouths shut, though sometimes they are the ones writing cogent and articulate pieces that help to shape the conversation. Listen and watch. The Workers are out there. or a dove whistle through air? the spider missed by the cleaning crew. or an owl brooch on a nurse’s lanyard. sending you prayers like rain. 1. Having the hard conversations. They make us better people. And that’s what we’re here for, eh? To become better people. 2. Spoken Word Play 14. We had our dress rehearsal last night. Dress rehearsal is actually my favorite part–that’s when I get to hear everyone else’s poems and stories. 3. Praying in any way I can. Being part of the web. I think I say this one a lot, but it seems to come around a lot. And I need to acknowledge within myself the anxieties I feel for the people I love, but I don’t want to dwell on those, so it helps to take it to this place, to give the mind the work to do. Send love. Send prayer. 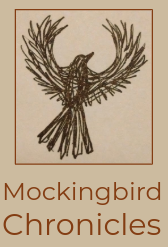 Send a mockingbird. of the now that approaches? of the day that is given? through the gray clouds of winter? and ears that hear the note of each plucked strand of moment. 1. Yesterday, the family together celebrating a woman of wisdom and compassion. Some families celebrate the New Year. We celebrate a birthday. 2. More conversations with the beloved community, with wise parents and in-laws and out-laws. How listening well and sharing ideas becomes more than the sum of all the conversational bits that appear. How ideas build upon ideas, and shape the ones that came before, and open up spaces for new thoughts to appear. How iron sharpens iron. How certain conversations at certain moments prepare me to do the Work that approaches. 3. Three golden rays of sun yesterday before the sun set, shooting through a rift in the grey cloud. The sun, the sun, the sun: I saw the sun! And now, here in the crisp morning, nothing but blue above, and golden shine now slipping over the ridge and into the hollow. 4. I have been listening this week to Mindy Nolt’s Movers and Lovers, deeply and intensely, grateful for each phrase. Move. Love. Listen. 5. The Work. I am learning, slowly and in tiny little ways, to stop asking myself what I can get from each moment, but instead what my Work is here in the moment. And realizing, ever so dimly, that when I am really doing my Work (really doing my Work), I am also receiving what I need. May we–in each dawning moment of this coming year and week and day–walk in Beauty! Last night, I went to my thirtieth high school reunion. I think there were about 23 or 24 of us classmates there, along with many spouses. We talk about the beauty of youth, and I know the fact of that because I spend my days with teenagers. I heard somewhere once that someone had somewhat scientifically determined that we read the pinnacle of our physical beauty around age 30, and I can understand that, too. But for well-polished and gracefully-tempered beauty, sit in a room of people just about to enter their second half-century. I am trying to define the essence of it this morning: there’s grace in the faces, self-acceptance, a movement beyond the scrabbling and striving of earlier years. The intervening years since we graduated have brought terrible pain to some of us, great joys, power and powerlessness, anxiety and fulfillment, and the stories and conversation last night were carried on a stream of grace that echoed in people’s voices and showed in their eyes. People seemed to have moved into themselves. They are beautiful in ways that make our high school selves look raw and unpolished, our young adult selves look over-polished and grasping. These people were shining and grace-filled, and in a way that admitted of the harsh realities that we have experienced on our way here. Gathered in that room, I know, were people of all political stripes. Many of us sit firmly on one side or the other in the debates that are threatening to shatter our church. But last night, we were one thing, one group, together sharing our stories. Some stories got deeper, but many of us told the basic details. Still, the regular tales of children and grandchildren born and growing up, of jobs and farms and hobbies–all took on deep significance. There was an acceptance and a sense of belonging in that room, where many of us have become near-strangers over the past 30 years. A moment of laughter appeared in the room. Giggles and chuckles. Then, as understanding dawned, a second wave, and a third. And the laughter itself became a conversation. Meaning was there, and levels and layers of meaning that went beyond the initial words that sparked the laughter. Something holy happened in the laughter. Did it last for five minutes or for twenty? I feel shy and awkward with small-talk conversations with people I don’t know well. Often I can push my way through and into small chat, but I never quite know how to navigate a room. How long do we talk? What about the awkward pauses? Is it my turn to start the next piece of conversation? It’s always easier for me when the conversation gets going on its own track, and I lose awareness of the way into the conversation, when mutual curiosity draws us together and lends energy to the forward movement of our talking. In mingle-settings where there are lots of people, I also get a sense of wanting to connect with everyone, so I struggle to get into deeper conversation because there are too many people to connect with. I get overwhelmed. So the thing that I look forward to in reunions and gatherings is the group sharing. Even though it isn’t intimate, and we each package our story into the short five-minute moment we are allotted, we all focus, for those moments, on the one person speaking. We hear story together, and for a moment, we are a re-gathered community. I have written before about the feathers. Two years ago, it began in mid-July: I realized one day that I had been finding a feather every single day for about two weeks. I kept watch, then, and realized that, until early September, I found a feather almost every single day. Last year, it was longer: early July through the end of September. I needed feathers then. I was jumping off a cliff into a new and unknown wind, and I needed the reminder that my wings would carry me. They did. I used the idea to talk to my students about how we make the meaning in our lives, how the Science me said, “Yes, there are owls hard at work in the holler, and the little birds are feeding the next generation of owlets.” But the Poet me said, “Yes, I needed an affirmation from outside myself that I had wings that would catch the wind, and the message was feathers.” I get to choose the meaning for my own story. And both meanings carry a certain truth, enriching each other. We all choose our meanings, even when we’re not aware of consciously doing so. This year, back in early August, I had a run of about a week of feather-finding. I thought I was back in business, but then I didn’t find any for a couple weeks. Now again, for the past ten days or so, I have found a feather every day, sometimes at home, and sometimes at school. Another shifting meaning story that came my way again today is that of the Palimpsest, the old vellum manuscripts which were scraped when one text was no longer necessary, and new words written on the pages. Highly valued by modern researchers, the re-appearance of the “under-text” gives historians not one but two texts to work with. When reading a palimpsest, you must look beyond the surface text to read the deeper meaning. A colleague of mine today showed me his journal, an altered book, in which he is using gesso to white out old text and writing his own text on top. We got to talking about how people are palimpsests, too–how important it is to read beneath the surface to the deeper “text” that shines through the surface layers. 1. Challenging conversations. I am learning to balance the speaking and the listening, I think. Still, there is so much to learn, so much to practice. 2. The miracle of the heart, of the heartbeat. 1. That spider whom I dislodged from a corner of a little-used bin yesterday. As she scuttled away, I saw three swelling egg sacs. I hung them carefully in an out-of-the-way place, and then found Mama Spider again and shooed her onto the egg sacs. She immediately took up her guard there again. Fierce Mama Protectiveness, even in Arachnia. 2. New Computer. I’ve been feeling a tiny little bit overwhelmed by the size of the technological learning curve as I prepare for school, but a little time playing and fiddling does go a long way toward making me feel comfortable in these new virtual rooms. 3. Community Building. I am pushing my getting-started classroom plans back a day or so in order to do some community-building exercises in my classes. Before we talk about Narrative Structure in Literature, we’ll tell our own stories. 4. Good conversations. Thank you for being my village, friends. 5. Even though I really loved that dress, I am incredibly grateful that it tore BEFORE I wore it to a day of school meetings rather than when I got there. I’ll hem it up and make a shirt of it.